Today was Field Day at school. The kids had a great time. The weather was perfect! 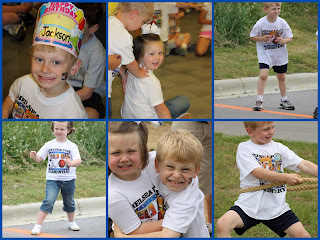 Brylee actually runs faster than Jackson. Jackson's class won 3rd place overall! Brylee took clothes to change into after field day bacause and I quote "it was a boy shirt and I don't like to wear t-shirts and tennis shoes". She is a women after her GoGo's own heart! TGIF!!! Birthday weekend for us... family in town... lots of celebrating going on and baseball games to play! See you soon!